Spoiler alert! 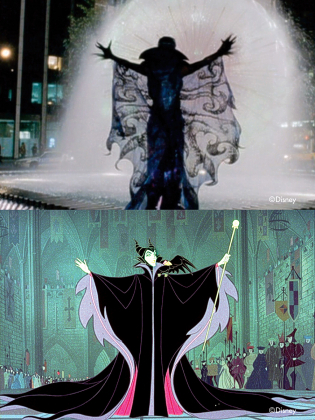 Disney’s Enchanted is, of course, peppered with many multiple and varied kinds of in-jokes and references to the classic Disney films that it draws on for inspiration. 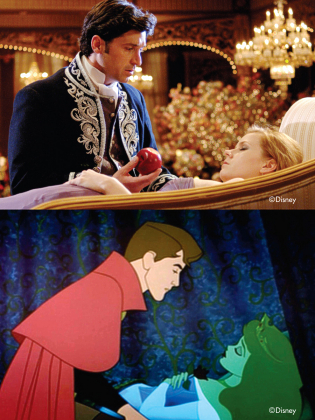 Look out for the name of Robert’s law office, the name of the restaurant where Robert and Giselle share a date, and the many character names – all of them witty nods to Enchanted‘s animated heritage! 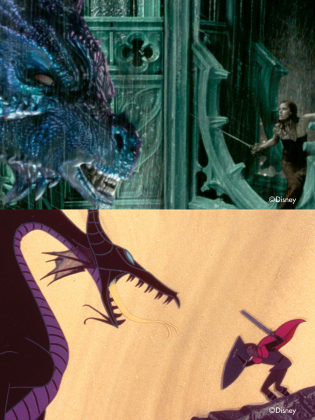 Even some of director Kevin Lima’s sequences contain more literal visual allusions to the film’s Disney pedigree, as demonstrated by these still frame comparisons! 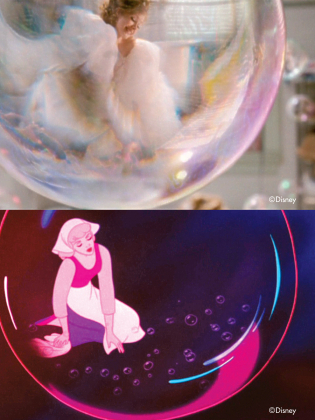 Enchanted is naturally filled with many more touches than these, but here’s a selection to get you off and running! 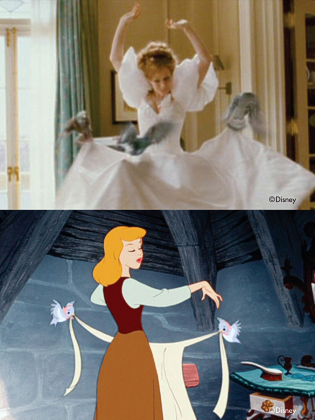 After arriving in New York, Giselle (Amy Adams) puts her new animal friends to use clearing up Robert’s apartment. Just like Cinderella, birds tidy up Giselle too, tying her bow back in place! 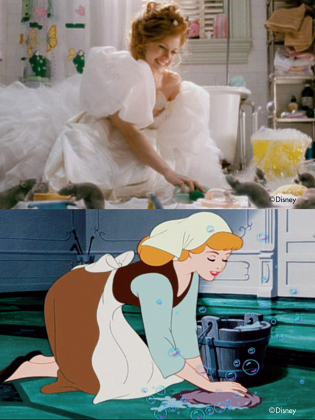 Cinderella again: as Giselle and the rats scrub up the bathroom, we’re reminded of the bubbles from a classic scene! 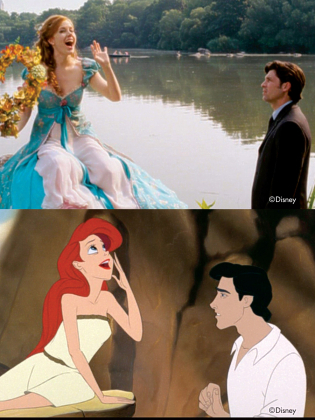 In the Central Park-set musical sequence That’s How You Know, Giselle calls out to the birds, Little Mermaid style. 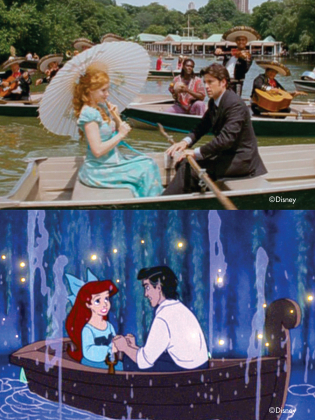 Later in the same sequence, Robert doubles Prince Eric, taking his Ariel, Giselle, out for his own boat ride! 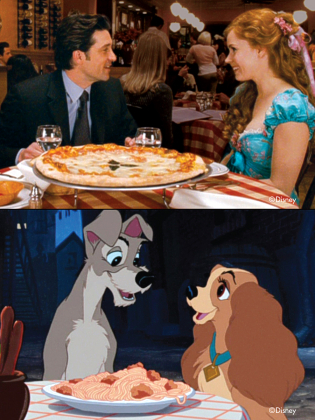 At the Bella Notte restaurant, Giselle and Robert (Patrick Dempsey) share an appropriate meal, striking the pose of a pair of characters from one of Walt Disney’s most romantic films! 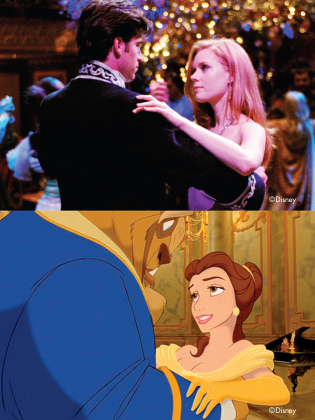 At the King’s & Queens Ball, a number of shots reflect the moment Belle and the Beast fall in love! 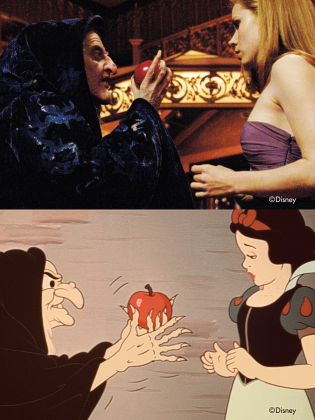 The apple bitten, Giselle lies unconscious, waiting for true love’s kiss which, as is tradition, must be sealed before the clock strikes midnight! 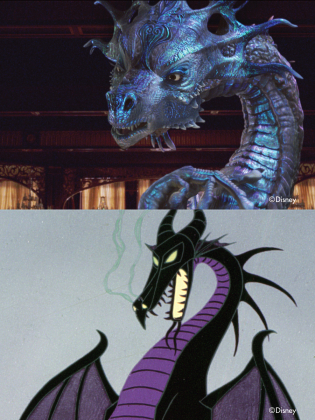 Narissa’s plan foiled, she exacts revenge by transforming herself into a malevolent dragon, just like in Sleeping Beauty! As Narissa crawls out into the rainy, lightning lit sky, Giselle grabs Edward’s sword and climbs up the perilous high-rise to face Narissa once and for all! Will she live happily ever after? 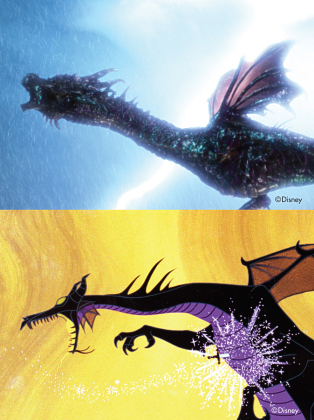 All stills courtesy of Walt Disney Studios Home Entertainment. All rights reserved.